Desertification is the (man-made) turning of once-fertile land into useless desert. It is closely linked to homeless poverty and starvation. It gets progressively worse as the land’s productivity declines, the living conditions become precariousness, and access to essential resources-and-opportunities disappear. An accelerating downward spiral is created in many underdeveloped countries by overgrazing, land exhaustion, and over-extraction of groundwater in marginally-productive dry lands, due to exponential overpopulation, and unreasonable pressure to produce more food than the land can. The Abrahamic religions of Hebrews, Christians, and Muslims have a common belief in Genesis 2:7: "the LORD God formed man of the dust of the ground, and breathed into his nostrils the breath of life; and man became a living soul." "Adama" is the Hebrew word for earth. "Adam" literally means "man made from dirt." From a scientific biochemistry perspective, humans are indeed made out of living dirt. The elements in our bodies match what is found in fertile ground. "We are what we eat" and all of our food comes from "adama." The unsustainable problem that we now face is that uncaring profiteering factory farms are rapidly depleting our precious top soil - the mother of humanity. Population is exploding exponentially, while we are killing our source of future life. Farmers are becoming their own executioners, contributing to the voluntary suicide of humanity. The rest of the world is sadly imitating American self-destructive agriculture. We now rely on very-few monoculture food sources (like rice, wheat, corn, tomatoes, and beans). Their seeds have to be replanted annually. Their roots never have a chance to grow deep. Constant irrigation and occasional rain storms rinse away the shallow top soil that we grow these foods in, creating man-made deserts that lack the essential elements required by our bodies. Fertile organic top soil has about 54 essential nutrients that humans need. When factory farms deplete the soil, they use fertilizers made from petroleum and natural gas that only replace four of these essential nutrients and none of the living microorganisms. Our factory farm food looks like real produce, but it is actually just a poor-nutrition corrupt counterfeit. When top soil erodes away, it takes about 500 years to replace the nutrients and biodiversity found in one inch of healthy living soil, that humans need to survive and thrive. Even a year of organic composting does not entirely undo the damage that man has done recently to "adama" - our source of life. We strongly recommend that you watch the documentary "Dirt" http://www.DirtTheMovie.org/ which is available on DVD, and from multiple online Internet sources (like Netflix, etc.). Impoverished-nation decision-makers are understandably averse to invest in arid zones with low potential. This absence of investment contributes to the further decline of these areas. When unfavorable conditions are combined with an absence of infrastructure and access to markets, plus poorly-adapted production techniques and an underfed-and-undereducated population, disaster becomes predictable and almost unavoidable. 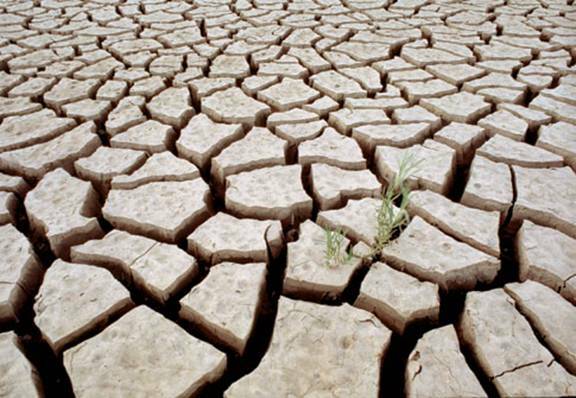 The United Nations reports that in only 10 years, 50 million people will become refugees due to desertification. The lack of habitat-and-food supply, and the resulting chaos, will affect the lives of TWO BILLION PEOPLE. The issues of famine, refuge, and war over declining unsustainable resources will consume human civilization. Mankind MUST find a totally-new, sustainable path toward a prosperous abundant life. The proven potential is merely waiting for those with critical thinking skills, powers of observation, compassion, and transformative, innovative, open minds. 6,000 years ago, North Africa was a lush green grassland that supported diverse plants, large animals, and happy humans. Cave paintings show humans swimming in what is now uninhabitable hot dry desert. Climate change resulted in the death of the mediocre majority who resisted change. A few more-intelligent adaptable people migrated east to the fertile Nile River Valley. Egyptian Pharaohs encouraged study of astronomy and mathematics to help predict Nile River floods and droughts. They directed their people to build dykes, dams, and reservoirs to deal with annual changes is water availability. 4200 years ago, a combination of human over-extraction of scarce water, and significant climate change, exceeded the limits of man-made reservoirs, the means to produce food and drinking water dried up, and the complex Egyptian Empire rapidly collapsed, leaving only their enduring stone ruins. Egyptian “civilization” left monuments to their technology, BUT they exceeded the capacity of variations in their local climate. When the Great Pyramids were built thousands of years ago, this location was NOT a useless desert. Desertification Clearly Kills People and Entire Cultures. Although the precise historical details are somewhat controversial, it is clear that when Egyptian culture had the abundance to be able to build the Great Pyramids, there must have been sufficient water, fertile land and water to grow the food that they required. Killing miles of nearby trees (to be used for fuel and construction), was clearly UNSUSTAINABLE. The wealthy arrogant Egyptian Pharaohs, who paid for their own stone burial Pyramids, knew that wood construction would not last. Wood must have been used for worker residences, but they have long since rotted and blown away, along with the Pharaohs’ palaces. The Great Pyramid at Giza is the last remaining of the Seven Wonders of the Ancient World. It is still the most massive man-made structure on Earth. With radically-reduced trees in the area, the top soil eroded away, and left no way to grow the food that was necessary to survive, leaving nothing behind but essentially-lifeless deserts today. The ancient pyramid builders must have moved toward the Nile River Delta, and the valley, near modern Cairo. Today, the Sahara Desert is the hottest-and-driest large place on Earth. The fossil record shows that 95-million years ago it was a shallow sea, teaming with a great diversity of marine life. Its margins were covered with lush green vegetation. The largest dinosaurs of all time lived there (90-feet-long - ten times larger than T-Rex). They thrived on 1,000 pounds of vegetation a day. Plate tectonics tilted the area and the sea drained into the Mediterranean, which initiated a climatic feedback cycle that started drying the area. Humidity fell, plants died, and the Sahara subsequently got progressively hotter. Today, parts of the Sahara only receive a trace of rain once every twenty years, and the temperature can be well-over a deadly 130 degrees F. One such place has a rock outcrop with a cave that was occupied by humans 5,440 years ago. Its cave paintings show native people swimming in rivers. This water and vegetation supported a healthy community of thousands. Only 6,700 years ago, much of what is now the Sahara Desert was covered with rivers, lakes and various forms of grasses and vegetation (based on carbon-14 dating of the remains). Slight changes in Earth’s axial tilt and orbit around the Sun caused gradual climate change, which was amplified by a negative weather-and-loss-of-vegetation feedback loop, combined with human over-exploitation of declining resources. "Perihelion” is the point in Earth's elliptical orbit when we are the closest to the Sun. Today Perihelion occurs in early January. This means that the northern hemisphere is warmer in the winter and cooler in the summer than the southern hemisphere (the same distance from the equator and from a large body of water. 9,000 years ago, Perihelion occurred at the end of July. The Northern Hemisphere received more solar radiation in the summer, which amplified the African-and-Indian summer monsoon (rainy season precipitation), making the Sahara more green. Small changes in many delicate environmental variables can have huge climate impacts. This is why scientists are so concerned about the potentially-chaotic impact of today’s man-made greenhouse gas emissions, gradual climate change, deforestation, etc. Eventually, Earth’s complex interdependent ecosystems reach an inevitable “tipping point”, where the temperature / humidity / vegetation feedback-loop accelerates, and climate changes suddenly around the world. Our current best scientific climatic computer models cannot predict this type of life-extinction event with precision, but we can see that it has happened multiples times in the past. We will not know for sure until it is far too late to correct. CLEARLY, deforestation and atmospheric greenhouse gases play important roles. Both are unsustainable elements of the modern Suicide of Humanity. The Sahara desertification cycle continued until roughly 3,600 years ago. Africans were forced to move near the remaining rivers like the Nile, Tigris and Euphrates Rivers that flowed from the mountains to the sea. These life-giving rivers were depicted on the oldest known map in history. The monsoon rains have decreased from what they once were when humans moved to the fertile river valleys. As population grows, over extraction of water, and a cascading negative feedback cycle on vegetation, are growing worldwide concerns. The depleted Nile River no longer flows to the sea. Man-made reduction in humidity is increasing Sahara desertification. Unlimited exploitation of mangrove forests leads to desertification in African coastal zones. Mangroves help control salinity. When mangroves are destroyed for construction and fuel, once-fertile land becomes useless salty deserts. Another negative aspect of mangrove deforestation / desertification is the destruction of food-source habitat. Mangrove forests are nursery grounds for many species. Their removal results in a dramatic decrease in biodiversity and food supply. Poverty is one of the direct results of indiscriminate exploitation of coastal resources such as juvenile shrimp, fish and oysters. In Toubacouta (Sine Saloum region, southern Senegal), mangrove forests have been almost completely wiped out by the local desperate SUICIDAL poor people. Oyster-farming and artisan fishing are no longer possible in many villages, which contributes to growing self-imposed inhumane African starvation. Land degradation and desertification are consequences of terrible mismanagement of land by impoverished people. Due to the growing number of people and large area affected by land degradation, self-destruction is clearly being caused by (anthropomorphic) human activities. Increasing over-population places enormous stress on the growth of food, which further degrades the land, making even less food available in the future – A very-negative unsustainable feedback loop. There is increasing historical-and-modern scientific evidence that desertification is a strong driver of global climate change. Land degradation is caused by many influences including: exploding population growth (3% per year in Africa), poverty, inability to invest in appropriate modern, efficient, agricultural-and-land-management technologies, constraints imposed by international trade agreements, and local agricultural-and-land-use policies. This is placing an avoidable burden on all nations that provide aid to Africa. The serious long-term impact of increasing man-made desertification is being felt around the world. There is a very-powerful eco-lesson to be learned from ancient man-made deforestation and desertification. THEY ARE BOTH SHORTSIGHTED FOOLISH SUICIDE. As 2 Billion modern humans burn wood and other biomass to cook with and to heat their homes, and we slash-and-burn rainforests to raise sugar cane, clear land to build crowded inefficient megacities, over-extract water, and strip marginal grasslands clean, modern humans are doing exactly what the pyramid-builders did, which ended their own great culture thousands of years ago. American overgrazing and rapid thoughtless over-development created the “American Dust Bowl”, contributing significantly to The Great Depression (as described in the 1940 epic movie “The Grapes Of Wrath” ). In the 1930’s and 1940’s, Desertification dust storms were sometimes over a mile high. Midwest dust clouds darkened the sky and made New York streetlights come on in the middle of the day. In Oklahoma, there were over 200 farm foreclosures a week. Jobs became very scarce. “Lucky” hard physical laborers were paid only $20 per week, while the unemployed starved. Dust Bowl mid-west crime exploded. The oppressive wealthy people with nice houses and cars became the target of robberies and kidnappings. Bank robbers became legendary folk heroes, to the jobless masses who lost all they had to bank failures. Similar livestock field, forest and farmland over-exploitation, plus water over-extraction is NOW happening once again worldwide in the 21ST Century. Non-learning people have forgotten the valuable lessons of 1930’s USA Dust Bowl desertification. The number-one global killer of nearly 10,000 humans every day (mostly children under 5 years old) is currently a lack of clean uncontaminated water. 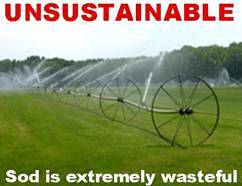 Our current overuse of finite-supply fresh water sources is Absolutely UNSUSTAINABLE! 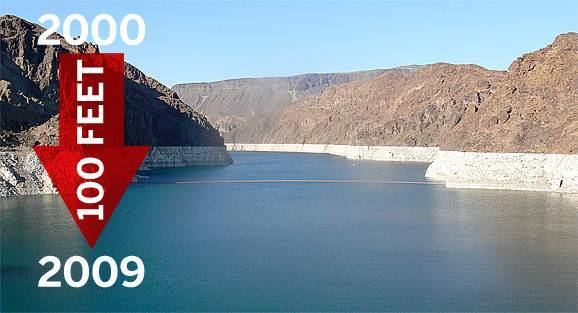 The water required for our outrageous government-subsidized biofuels (that emit CO2, and deadly aldehydes) makes the accelerating rate of man-made desertification much worse. A widespread man-made Climate Change drought could soon threaten the delicate U.S. water balance, agriculture, and drinking water. 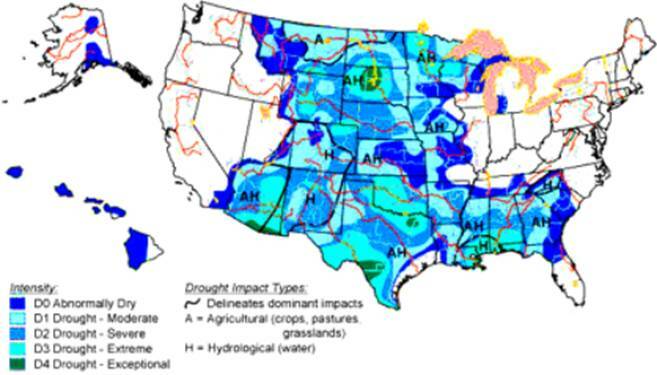 They even have a time-lapse animation generator that can precisely show state-by-state quantitative historical Drought Impact Reports, over any period of time that you would like to study. Over-burdened American farming is once again on the path toward Dust Bowl desertification, which helped fan the devastating economic fires of The Great Depression. However this time, much MORE than one third of USA is being threatened with near-term catastrophic desertification devastation. Modern corn now requires 4,000 gallons of water per acre PER DAY. 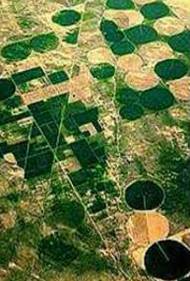 Irrigation circles are inefficient with land. Spraying scarce water into the air where most of it evaporates is STUPID BEYOND COMPARE. 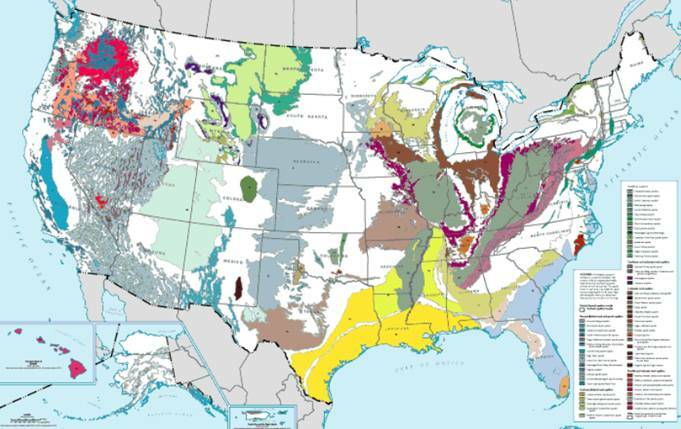 What will happen WHEN America’s underground aquifers dry up (in one generation)? Man-Made Deforestation has already killed 95% of our original old-growth trees, (which used to help retain water runoff, prevent soil erosion, sequester CO2, and stabilize USA climate). Many older U.S. shallow wells have ALREADY GONE DRY. The 21ST Century American trend toward Dust-Bowl-like re-desertification is now indisputable Scientific FACT. Those with functional powers of observation can clearly foresee our inevitable global water crisis, and the extreme social chaos and water wars that it will soon cause. We cannot sustain water consumption for America’s CURRENT population. Our fresh-water-over-burden shortfall, and resulting famine, will only get MUCH WORSE, as an additional 100 million (illegal) immigrates are added in only about 25-28 years. Worldwide, once-great rivers like the Colorado, Rio Grande, Nile, Jordan, Indus, Murray, Yellow and Oxus NO LONGER FLOW TO THE SEA. 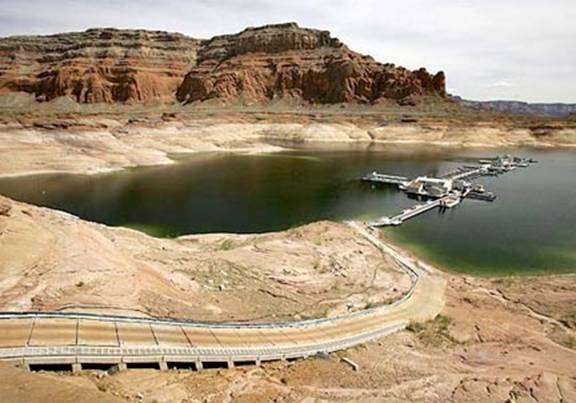 Lakes like Mead and Powell no longer fill up. State-against-state litigation over disputed essential water rights is heating up the future American Civil Water Wars. All across America and much of the rest of the world, once-abundant sources of water are drying up at an accelerating pace. In only a few recent years, this ABSOLUTELY UNSUSTAINABLE trend has been rapidly getting much worse, primarily due to exponential population growth, and over-extraction of dwindling water supplies. Our increased droughts are NOT normal weather cycles. 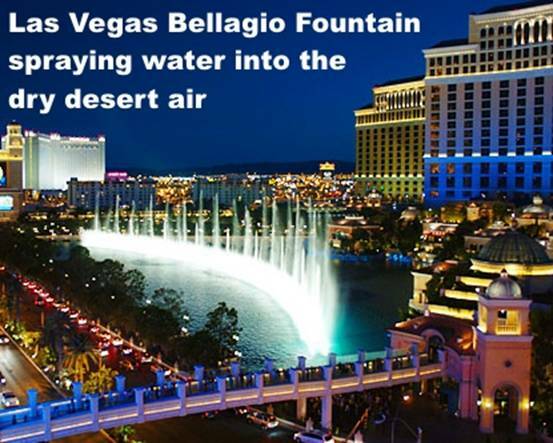 First the rivers, streams, and aquifers dry up, then the nearby protective vegetation dies, local climate changes (with hotter summers, colder winters, and extreme droughts, with unprecedented floods elsewhere), and eventually previously-bountiful habitat turns into desert. Man-made higher temperatures increase evaporation, which can fall into the ocean, marginally contributing to a small increase of sea level (which will combine with the larger influence of polar ice melting to flood our at-risk coastal cities worldwide). California is America’s MOST-productive agricultural state – ONE MILLION Acres of CA farmland that were very-productive in 2008 could NOT be planted in 2009, due to Inefficient Private Waste of Scarce Water - Contributing to Worldwide STARVATION. 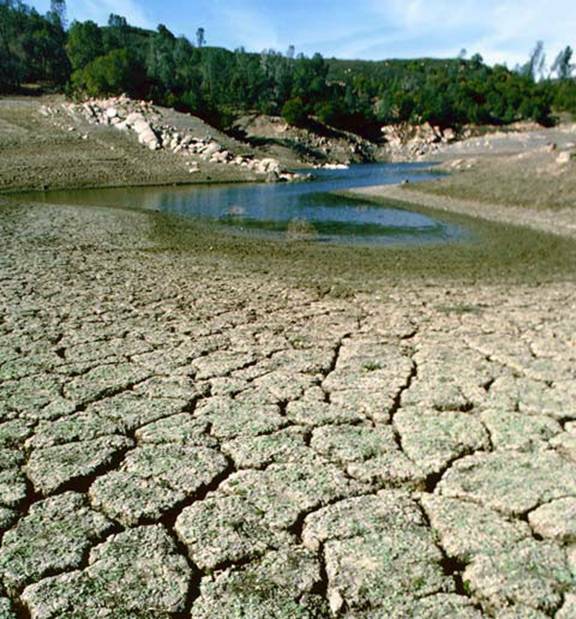 Extreme water shortages are measurably increasing every year. There is not enough clean fresh water for today’s population – What will we do as population continues to increase exponentially? Current desertification trends can only lead to the unnecessary death of BILLIONS worldwide. A billion people already lack sufficient fresh water to live a healthy long life. Lack Of Clean Water Is The #1 Killer Of Humans Today. 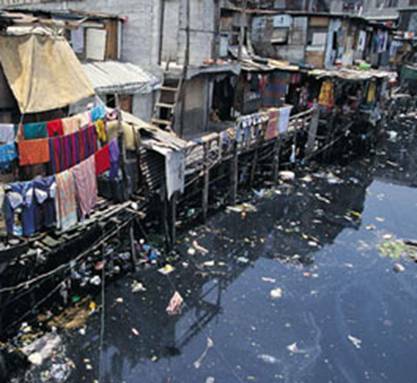 Bad Water Kills nearly 10,000 people PER DAY. This already-devastating trend will soon become MUCH WORSE. 13. Rheumatism, Headaches (Dehydration abnormally increases the concentration of toxins in the blood plasma and cellular fluids – Joint-and-other pain, like headaches, increase in proportion to the concentration of plasma toxins) Most pain medicines (including common NSAIDs) damage the sensitive liver, kidneys, brain, and central nervous system. All medications have negative side effects (many of them in the liver). Intelligent people should correct the problem source, NOT just treat the cascading symptoms. Proper hydration is essential to all earthly life forms. When we run out of petroleum, it can be replaced with free sunshine, wind, etc. BUT, when we run out of clean fresh water, what can humanity replace it with? Desertification is just one symptom among many of UNSUSTAINABLE mistreatment of our precious life-giving blue-green-planet habitat environment. Wasting Precious Water Is ARROGANT GREEDY GENERATIONAL GENOCIDE. Spraying water into the dry air where it evaporates unproductively is far beyond criminally-insane manslaughter. Future generations are likely to curse our shortsighted selfish stupidity. Our grandchildren cannot exist for long without an Abundant Supply of Clean Fresh Water. As a child I swam in crystal-clear mountain springs that have since dried up, due to a total lack of intelligent water conservation, and man-made agricultural over-extraction. All things considered, it takes nearly 8 tons of water to produce one pound of beef. The exact amount depends on many factors. Some cattle ranching methods consume more water than others. Raising perennial fruits and vegetables consumes only a small fraction of the water required to raise, finish, and deliver unhealthy red meat from cattle. It takes 1,000 gallons of water just to produce one gallon of milk, which contains significant measurable amounts of blood and pus from the diseases caused by feeding beef water-thirsty genetically-modified corn and Monsanto’s terrible bovine growth hormone. China’s water footprint is about 25K cubic feet per year per capita. America’s is a grossly-inefficient nearly 90K cubic feet per year per capita. Each time we flush an average USA toilet, we waste more water than many thirsty people around the world consume in two days. People who have large dogs observe that the nutrients in urine (like ammonia) are a good fertilizer. Americans flush our urine down toilets, which adds unnecessary burden to our sewage treatment plants. We mix our sewage with harmful soaps that damage the environment. We insanely jam compostable food down garbage disposals, which clogs our own drain pipes and public sewage treatment plants. After disposing of valuable organic fertilizer and damaging the environment, Americans then use unsustainable imported-oil petrochemicals and methane-laden natural gas products (like ammonia nitrate) to fertilize our frankenfood factory farm production. There are about 54 important nutrients in rich, natural, organic soil. Man-made hydrocarbon fertilizers only replace four of them, leaving us with low-nutrition products that are really just counterfeit images of natural good food. We fail to monitor and regulate gross polluters that dump deadly toxins in our sewer systems and storm drains like plastics, industrial chemicals, and neurotoxic heavy metals such as common lead and mercury. Our oceans have become deadly-toxin garbage dumps. 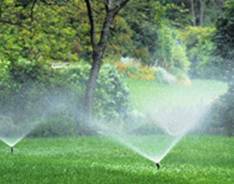 We spray our yards, gardens, and frankenfood fields with life-killing petroleum pesticides, herbicides, and various other biocides. We eat low-nutrition foods that have been genetically-modified to tolerate petroleum-based biocides, which are now in almost everything eaten by the mediocre-minded majority of unhealthy obese consumers. Very few people know how to grow good food that is not permeated with poisons. In today's upsidedown world, it is NOT profitable to do so. The new Monsanto genetically-engineered corn has about one fourth the valuable protein that the maize had that was raised by Native American Anasazi, Aztecs, Inca, and Mayans up to 7,000 years ago. 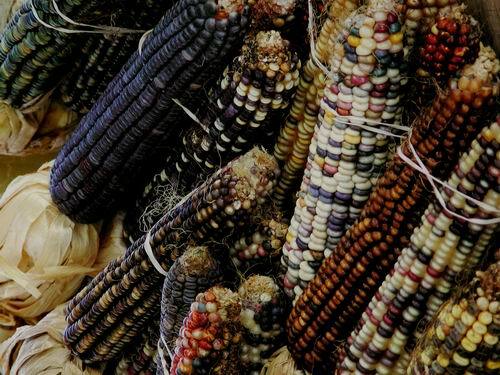 American human societies thrived on natural organic "Indian Corn" for thousands of years. Today’s low-quality, high-tech engineered high-yield corn has much-higher levels of unhealthy high-glycemic-index obesity-causing starch, and it consumes an enormous unprecedented amount of water per acre to grow. Monsanto corn is mostly empty calories. Frankenfood pollen has now been spread by jet streams around the world - badly-contaminating our perilous planet's food supply. Unmodified native organic corn is now extremely difficult to find and maintain. Some of the worst fears about 1980's genetic food engineering are starting to come true. REMEMBER: Monsanto is the company than created the terrible genetically-engineered excitotoxin "ASPARTAME", which is still in many deadly "diet" foods and beverages today. http://www.JoyfulAging.com/Excitotoxins.htm Many medical professionals have lobbied to make it totally illegal. I strongly agree. Years ago, Aspartame damaged my health until I eliminated it from my intake altogether. Frankencorn byproducts can damage the human pancreas and are now causing age-onset insulin-dependent diabetes in millions of innocent fat children. Thoughtless non-learning parents, government, and consumers are all to blame. Greedy factory farms care about the profits of "bushels per acre", NOT the safety, nutrition, or quality of what they raise. They do not even care about leaving a sustainable legacy for their own children. This is a far cry from proud pioneer family-farm agriculture that once made America great, BEFORE the days of deadly frankenfood factory farms. Cattle are allergic to frankencorn. Their digestive system evolved to eat simple primitive grass - long before modern frankencorn was invented a few decades ago. Today's corn makes animals that eat it produce huge volumes of methane greenhouse gas. Feedlot cattle are usually "finished" for 3-to-4 months on corn byproducts to make them VERY FAT. They are in a crowded coral so they intentionally can NOT exercise and develop lean meat. "Prime" beef is prized for its unhealthy, especially-high-saturated-fat marbling. American taste buds have been trained to love self-destructive fat plus sweet cholesterol-and-sugar-bomb foods - found in deadly happy meals with toy bribes for mediocre-mind mental manipulation, and addictive bad-habit formation. If you feed cattle corn for a year, most of them will die of ulcers and other internal disease complications. The profiteering feedlot "finishing" process really does finish their life quickly, (similar to the way that corn-caused morbid obesity shortens the life of humans). Old beef is not worth much economically (just like greedy corporations seem to feel about senior citizens). Cattle ranchers are NOT trying to raise long-lived animals, or healthy consumers that eat their pervasive profiteering poisonous products. Our profit-motivated factory farm priorities are killing all of us. Butchers used to advertise "corn-fed beef" as though it was a good thing. In truth, corn-fed beef is the cheapest, lowest-quality, poor-nutrition meat you you can buy. Insane corrupt politicians subsidize the suffering and death that corn-fed beef continues to cause today - It buys votes from farmers. Scientific studies show that eating corn-fed beef shortens your life expectancy. In the March 23, 2009 issue of the Archives of Internal Medicine, a U.S. study of 545,000 people found that eating the equivalent of a quarter-pound hamburger a day raised a man's risk of dying of Cancer by 22%, and of Heart Disease by 27%. Most non-learning Americans are in total denial. They eat hamburgers because they are CHEAP, not because they are healthy. How do YOU chose to die? Do you wish the same pain and suffering for your children? What impact is your lifestyle having on our precious planet? An average adult only needs about 90 pounds of protein a year. Vegetarian animals and humans get all of the healthy protein that they need from non-meat sources. Unhealthy Americans eat over 200 pounds of life-shortening meat per year. Much of it is bad beef and pork that consume huge amounts of water and energy to raise. Processed meats often have carcinogenic preservatives added. Our federal government allows ground meats to be sold that contain 3% living bacteria (like deadly e-coli). Many meats exceed the limit. We frequently have large recalls or tainted meat produces AFTER humans have been injured or killed. There is very-little effort invested in preventing such tragedies. Improperly-prepared meat can kill quickly. Muscle meats cooked over 250 degrees F contains carcinogenic heterocyclic aromatic amines. If 7 Billion earthlings ate 200 lbs of meat a year, we would need the resources of three more Earths, just to feed unhealthy gluttons. There is not enough fresh water on entire Earth today to raise even 50 pounds of meat per person per year. We must have superior protein solutions (or exterminate 4.5 billion humans in the near future). 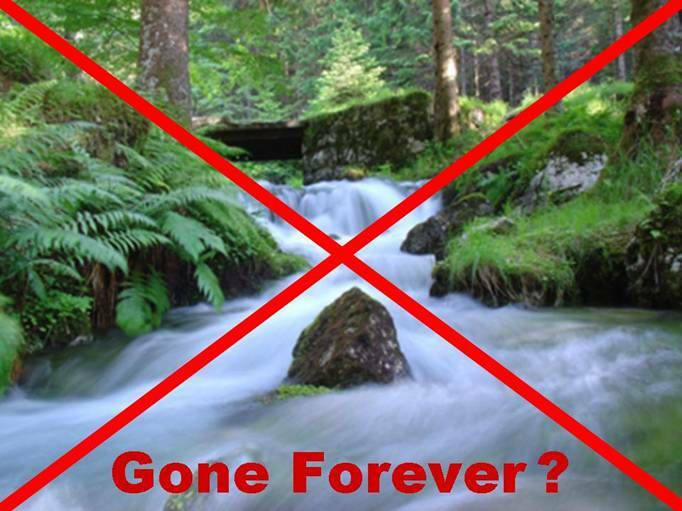 What kind of food-and-water legacy do you want to leave your children and their offspring? Grass-fed beef takes longer to finish naturally, but their meat is leaner, and it has much-higher omega-3 EFA's, which help reduce the impact of cholesterol on human heart attacks and brain strokes. In general, Zero Energy Design strongly recommends against eating red meat, but if you do, it should only be from organic, natural, (grass-fed) sources. Bill Clinton finally learn this lesson AFTER clogged arteries and multiple heart surgeries nearly killed him. Subsidized corn-fed beef appears to be CHEAP and abundant in America. High-quality healthier beef is rare and expensive. Today's cheap hamburgers are nothing but saturated fat disguised as meat. 65% of the calories in most hamburgers comes from DEADLY FAT! That $1 double cheeseburger is EXTREMELY EXPENSIVE (if your health and longevity matter at all). It should be a felony to feed beef burgers to children, just like smoking and alcohol should be illegal (especially for children). Family farms used to raise most of their own food. Today, farmers that raise frankenfood know enough to not eat what they raise purely for profit and government subsidies. Many struggling farmers are quietly ashamed of the poisonous products that they now produce. They are NOT paid more for producing safer, healthier food. They are paid for producing high-volumes of deadly life-shortening frankenfood. Unhealthy starch corn is now in 70% of the food products on today's grocery store shelves. High-fructose corn syrup is in most products that are targeted at the taste buds of children - even some baby formulas! HFCS is believed to damage the pancreas and shorten the life span of our kids. Corn-caused obesity and deadly diabetes in children have become epidemic symbols of what our government subsidies have done to extremely-evil American agriculture. We need to inspire a new generation of SUSTAINABLE, HEALTHY-FOOD future farmers and agriculture-research scientists. High-yield Monsanto recombinate-DNA-gene-splicing corn requires a whopping 600,000 gallons of water per acre per year – even more in drier areas. If the yield is 180-to-200 bushels of corn per acre, that means that the crop uses at least 3,000 gallons of water for each bushel of corn. THIS IS TOTALLY UNSUSTAINABLE WITH TODAY’S ALREADY-OVERBURDENED DECLINING WATER SUPPLIES. Even ancient non-renewable well water from the last ice age is about to be depleted by our grossly-inefficient misuse of precious water resources. Farmers are having to drill deeper wells, which will soon run dry – devastating half of our farmland. The 1920’s Deadly Dust Bowl Days may very-soon be repeated in America. Heavily-subsidized American frankenfood is cheap when measured in declining U.S. dollars. It is however VERY EXPENSIVE when you include the deficit-spending burden to subsidize it, the deadly impact on dwindling water supplies, and the rapidly-rising cost of health care for the life-shortening epidemic that high-tech factory-farm frankenfood has already caused. Heavy surface irrigation causes runoff of rich top soil, mixed with petrochemical biocides. Soil lose is reduced somewhat with well-engineered drip irrigation. It takes 500 years to restore one inch or healthy top soil, IF the mulch is left on the ground to degrade naturally. Producing cellulosic ethanol would nearly terminate natural soil restoration. When there is no more affordable oil or gas for agriculture, an alteration in sewage pluming any the things we jam down our drains can be used to grow organic food and reduce our immoral, deadly waste of scarce, declining, fresh water sources. Why don’t we do this TODAY (as some other more-environmentally-intelligent countries have already done)? Answer: We are non-learning suicidal fools, who refuse to radically reinvent the terrible addictions of our parents. Desertification is just one of many symptoms. To say that this behavior is UNSUSTAINABLE is a gross understatement – IT IS SUICIDAL. 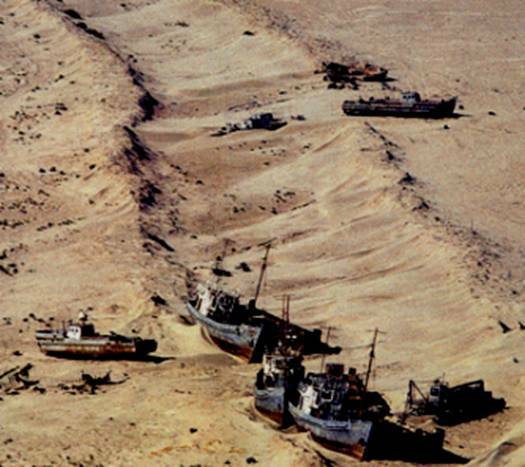 The Aral Sea used to be the World’s Largest Body of Inland Water, other than the U.S. Great Lakes. It supported a community of 60,000 fishermen. Nikita Khrushchev visited America and liked our approach to agriculture irrigation. He implemented a water over-extraction program, and now, THE ARAL SEA IS A BARREN DESERT – This is a well-documented example of high-speed myopic Man-Made Desertification. 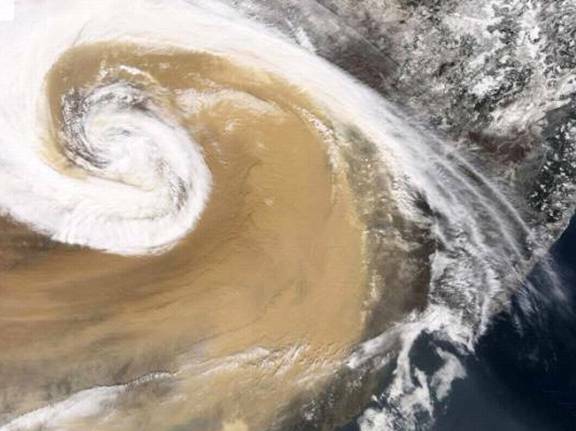 Giant sand storms are wreaking havoc all across China. They are now THE MOST DESTRUCTIVE STORMS IN CHINA'S HISTORY. Beijing frequently grinds to a halt for days, when it is blanketed in an airborne mountain of flying sand. Once a rare occurrence, mega sand storms are now a frequent part of life in Beijing. China’s Rapidly-Increasing Major Sand Storms: 5 – 1950’s, 8 - 1960’s, 13 - 1970’s, 14 - 1980’s, 23 - 1990’s, and in 2001 alone there were 32, with a sharp increase in the 21ST Century. Extreme overpopulation and over-extraction of water is drying up rivers and lakes, devastating livestock, vegetation, eroding topsoil, and disrupting China’s heavy population centers for many days each year. In the most-severe Chinese man-made-desertification sand storms, residents say that “It’s like it is raining sand.” An early warning system sounds to alert Beijing residents of the danger, as people must stay indoors. Airports are forced to shut down, since sand will instantly ruin all jet engines. Much of the sand originates in China’s northern and western deserts – the Gobi, the Takla Makan, and the Ordos. Airborne sands increasingly fall on Korea and Japan. China’s sands cross oceans and fall around the world. The environmental disaster in China has taken on global proportions. These lethal sand storms are awesome. Forty-seven schoolchildren died in a single storm. “China’s Raging Sands” video shows walls of sand a kilometer high stretching from horizon to horizon. These Global-Warming-powered sand storms have the force of a mid-sized earthquake, but unlike earthquakes, they do not last for minutes, but for days. Visibility in these tidal waves of sand can drop to less than a meter. Temperatures have dropped as low as minus 55 degrees Celsius. The storms can move at the speed of a freight train, overwhelming everything in their path. And when the winds subside, they deposit a layer of sand that suffocates the countryside. Global Warming and environmental damage have placed ONE-THIRD OF CHINA AT RISK (exactly like America during The Great Depression “Dust Bowl” years). Just 70 km north of Beijing, the Great Wall was built to keep invaders out of China. Today, desert sands reach that wall. At the current rate of expansion, Beijing will be surrounded by unproductive dead desert sand in the 21ST Century. China is now in a desperate race to stop the advancing sands. They are already way beyond the tipping point. Corrective actions are much too slow to keep up with the current rate of desertification. Scientific research and government policy are joining forces to address the huge desertification-and-sand-storm problems (unlike worldwide governments that ignored scientific warnings about Global Warming for thirty years). However, for Chinese herdsmen who have already seen their entire flocks wiped out, and farmers who have watched two-thirds of their villages disappear, any future solution will be FAR TOO LITTLE, FAR TOO LATE. In only a few decades, millions of acres of grassland that were once good for farming and raising livestock HAVE TURNED INTO DESERTS. “An Chengxin”, Chairman of China Foundation for Desertification Control: Global Climate Change and Overpopulation Accelerated Desertification says: “The Shiyang River in Minqin used to have ample water and vegetation. It is now Desert.” Since 1980, Oingtu Lake has turned into a desert. Ren Guoyu, China Meteorological Administration Director: Land use and man-made soil depletion have caused the world’s largest sand storms and desertification. Abnormal climate change is a crucial factor. Desertification is advancing at the same time and speed as industrialization and urbanization. They are the underlying causes - Death and starvation are the net effect. Lesson To Be Learned: Great Depression Desertification forced America to launch a revolution in animal husbandry, and aggressive attempts to rejuvenate the Dust Bowl. The legendary free-ranging cowboy had to disappear. 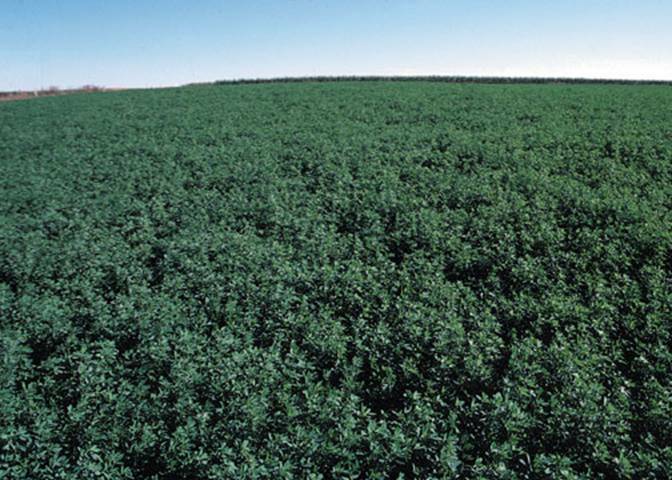 Barren land was planted with alfalfa, and now USA exports 60 million tons of healthy alfalfa a year. Alfalfa, rice and cotton consume large amounts of water. They are not cost-effective in dry climates. 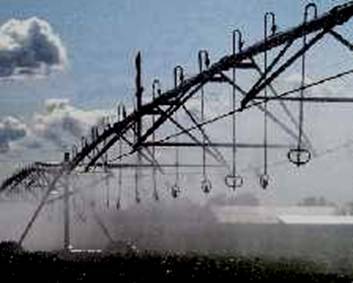 Higher-value crops should be raised where irrigation is required. The water source should be well-managed so it is recharged every year, or Dust-Bowl desertification will eventually occur. Where sufficient water is available to grow it, Alfalfa is low in Saturated Fat, Cholesterol, and Sodium. Alfalfa a GOOD source of Protein, Vitamin A, Niacin, Calcium, and a very-good source of Dietary Fiber, Vitamin C, Vitamin K, Thiamin, Riboflavin, Folate, Pantothenic Acid, Iron, Magnesium, Phosphorus, Zinc, Copper and Manganese. There is very-good reason that Alfalfa is now widely-used in many all-natural vitamin-and-food supplements. Alfalfa sprouts have an excellent ratio of 42% amino-acid proteins, 33% good carbohydrates, and 25% essential fatty acids (EFA’s like omega-3 alpha linolenic fatty acid). Alfalfa is very-low on the food chain, and thus it is extremely-inexpensive – needing only sunlight, a little water, and marginal top soil. It is interesting that replacing thoughtless overgrazing with planting crops that are appropriate for the conditions has had such a healthy impact on human nutrition (only for those intelligent people who pay attention to their family’s health issues). But, most myopic mediocre-minded Americans still eat far too much unhealthy meat, contributing significantly to land damage around the world. AND, to circulatory disease, high blood pressure, heart attacks, brain strokes, obesity, diabetes, neuropathy, blindness, amputations, and deadly liver-and-kidney failure. Gain-fed feedlot meat badly damages arteries with high saturated fat, and low omega-3, which REDUCES circulation. In contrast to eating beef, alfalfa IMPROVES healthy blood circulation. Cattle are allergic to corn (it is an unnatural food for them). Corn makes cattle emit huge quantities of methane, which is a powerful Global-Warming greenhouse gas. Cooking muscle meats above 275 degrees Fahrenheit creates cancer-causing heterocyclic aromatic amines – increasing the expensive risk of avoidable intestinal-and-colon cancers. Meat is high on the food chain and therefore wasteful, and not cost-effective to produce. Imported meat damages other nation’s land. Low-quality, inexpensive imports are often contaminated with deadly diseases, toxins, pesticides, herbicides, chemical fertilizers, heavy metals, artificial hormones, and indiscriminate use of antibiotics, which opens the door to exponential growth of antibiotic-resistant unstoppable superbugs. U.S. CDC says that 76 MILLION cases of foodborne disease occur EACH YEAR in America – some of them deadly. What-and-where does it come from? How does it get into your home? U.S. FDA says that far-less-than one 1% of American food imports are ever inspected, which leads to the death of many Americans, young and old. Poor nations with sub-standard hygiene, that export unhealthy food to non-caring, profiteering, unscrupulous U.S. food importers, know that of the 321 locations where foreign food enters the U.S., ONLY 90 OF OUR PORTS HAVE PART-TIME FOOD INSPECTORS, and 231 OF OUR PORTS NEVER HAVE ANY FOOD INSPECTORS AT ALL. Diseased food (and illegal drugs) flow freely across our borders and into homes. The world’s worst food (and drug) exporters-and-importers KNOW which U.S. ports to use to always avoid inspection! USA does NOT enforce our own food-safety laws. We have acquired a gluttonous appetite for inexpensive, contaminated, deadly food that greatly increases health care costs, and is the documented source of many disabilities, extreme sorrow, and slow, painful, unnecessary early death. Nearby, locally-grown fresh organic food is often far superior. AND, it does NOT consume huge amounts of unsustainable past-peek petroleum to move thousands of miles, from a country with filthy conditions. The 100 Mile Diet Organization is trying to convince us all about how important, healthy, and environmentally-critical it is to eat ONLY locally-grown food. Do YOU shop at farmer’s markets, or food stands next to the fields where food is grown by your personal friends? Did YOUR mother ever serve you a nutritious, fresh, organic salad, with healthy alfalfa sprouts having 42% protein? Using cheap “happy” toys to train narcissistic children to love imported low-quality, unhealthy cheeseburgers and French fries should be prosecuted as a FELONY AGAINST POSTERITY. Do your children have a laundry basket full of expensive throw-away petroleum-plastic happy toys that they never touch? Are you saving them as an antique legacy to remind us in the future of our extreme-unhealthy stupidity? Did your parents teach YOU to accelerate deadly deforestation and desertification, while sending the world’s largest transfer of wealth ever overseas to some of our worst enemies? Young children imitate their parent’s good-and-bad habits. How lazy is our society? America’s many misguided mistakes are now being imitated around the world. China’s sand storms are just 70 years behind America’s Great-Depression Dust Bowl stupidity, as their use of coal and petroleum spiral upward, and McDonald’s and Walmart span the land. China is completing TWO NEW DIRTY COAL-FIRED POWER PLANTS EVERY WEEK, while competing with the USA to drive up the international price of petroleum. Those who ignore history, and who imitate failed business-and-politics-as-usual, are condemned to forever repeat humanity’s very-worst avoidable mistakes. We must REVERSE OUR DECLINING DEAD-END TREND; seek the UNIVERSAL TRUTHS about health, fitness, efficiency, sustainability, and conservation. AND, Learn HOW To Live In Harmony With Nature. We are very-far from it today. Man-made desertification has many unwitting, uncaring, selfish human participants around the world, who are totally without a clue. Emerald Eco-City Is THE Cost-Effective Rapid Answer To Reverse Desertification - Planting millions of indoor-and-outdoor trees in the sunny desert, and self-sufficiently cradle-to-cradle-recycling pristine-clean interior water, with ZERO Pollution, ZERO Effluent Release, and ZERO Precious Resource Waste. Can you begin to see why Zero Energy Design is so very motivated and inspired to apply our proven track record of Zero Emissions NEVER BURN ANYTHING success to provide the cost-effective working details of our Emerald Eco-City Compelling Vision of a productive, prosperous, near future in harmony with Nature?